Import PlaceMakers Supplier Invoices into NextMinute – Welcome to the NextMinute support and feedback centre. 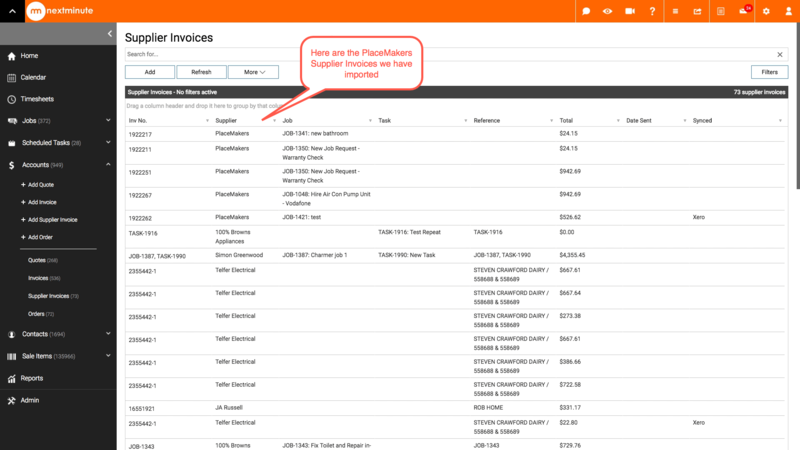 In this article, we will show you where to access your PlaceMakers Supplier Invoices from the last 6 months within your NextMinute Subscription and how to import and allocate to the relating Jobs. Also see; How do I know I have new PlaceMakers Invoices? Once you have selected Import Integrated Supplier Invoices, you will see a new window open with a list of your PlaceMakers Supplier Invoices in the left list and NextMinute Import Actions in the list on the right. 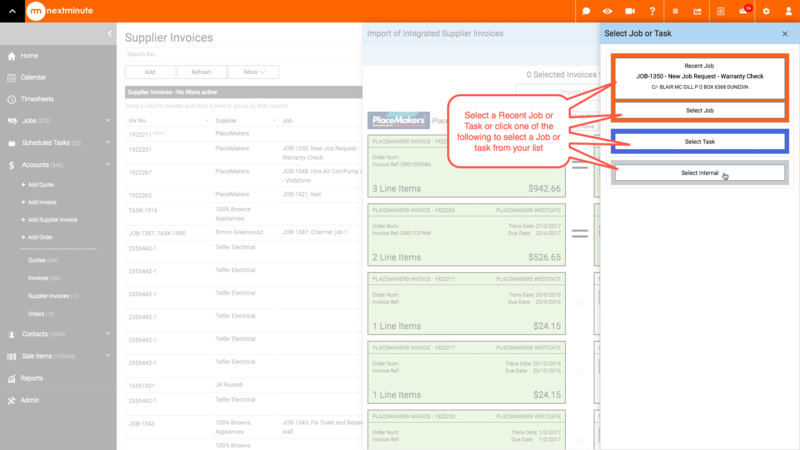 You will click on the Supplier Invoice to view the details (see Step 3). 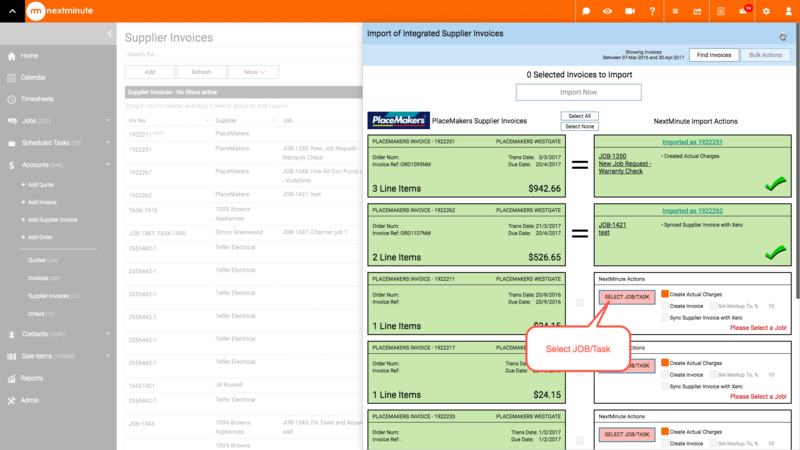 The below view shows you the selected Supplier Invoice, it is created as a draft until you choose to assign to a job and take appropriate action with this. To return to the Supplier Invoices Import window, choose the 'X' as shown below. The below views [Step 4 & 5] show you how to select and assign supplier invoices to existing jobs or tasks you have in NextMinute. You don't have to assign the Supplier Invoice to a Job or Task in NextMinute, you can just import into your NextMinute account. On selecting the Job/Task button as shown above, you will see recent jobs and tasks or you can choose to search for more from the jobs or tasks lists. Step 6: Import with required actions. Once you've assigned a job or task to your Supplier Invoice it is ready to import. Once you've chosen the desired action(s) [see annotations 1-4 below], you will be ready to select Import Now. 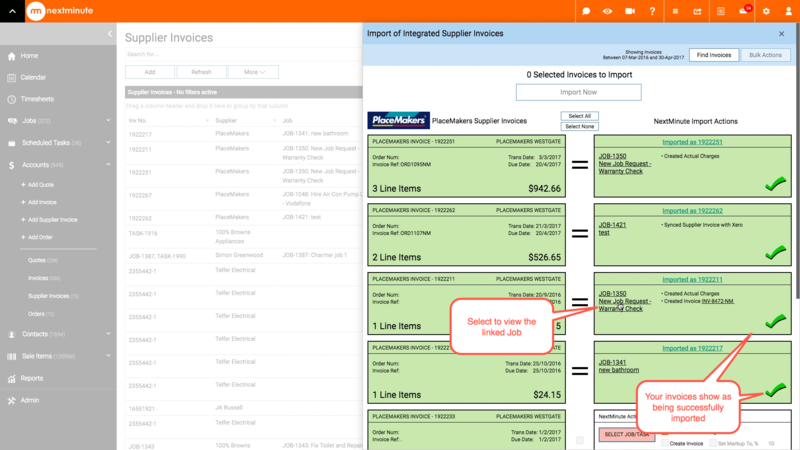 You can take action on more than one supplier invoice at a time, this enables bulk processing of Supplier Invoices. The screen shot below shows two invoices we've taken action for. 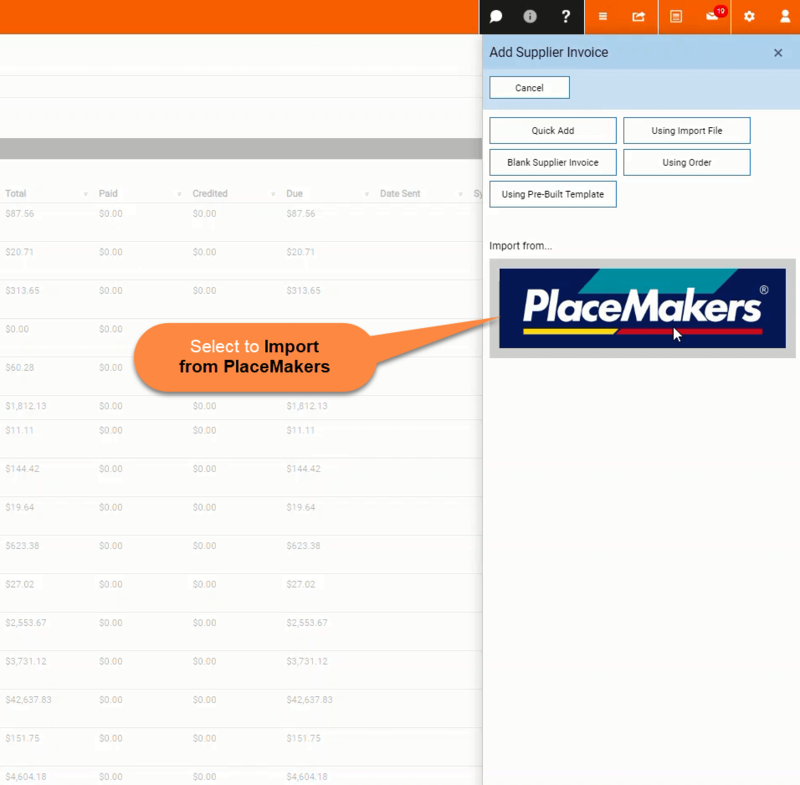 Step 7: Your PlaceMakers Invoices have been successfully imported. To check the actions are correct, select the Job/Task associated to open the Job Details fly-out. 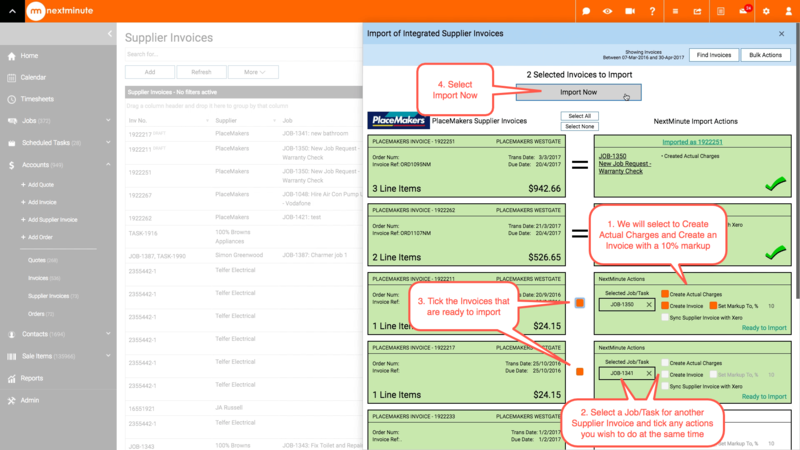 Here is where your Supplier invoices show after you import them. If you selected to sync with Xero or MYOB it will show as being synced. If you see "DRAFT" next to the invoice number, this means you have selected the Supplier Invoice to view via the import fly-out but have not yet imported it.